I have discussed aspects of the cookery of the French Nord-Pas-de-Calais-Picardie, the Franco-Flemish enclave contiguous with Belgium extending to the coast across from Dover, with an emphasis on its beer dishes. Some of its cheeses should be mentioned due to their distinctive qualities and connection to the area’s beer culture. Beer pairs uncommonly well with these cheeses, and also, is sometimes used to mature cheese in the north – is brushed on the rind – and even enters the paste in some products. Maroilles is a cow’s milk cheese made for 1000 years or more in the green and sometimes valleyed Avesnois district. It is fairly pungent and comes in a square, reddish block. With time the paste softens to a powerful, almost semi-liquid richness. Some producers still use raw milk or milk heated to a low temperature (thermisé), which improves the quality. Maroilles is eaten with beer in its home territory, appears after dinner with coffee, and also is used in the famed tarte au maroilles of the region, a cheese pie of great savour and rustic quality. I have eaten it in the area, indeed in bucolic Maroilles once, the hamlet which gave its name to the cheese. 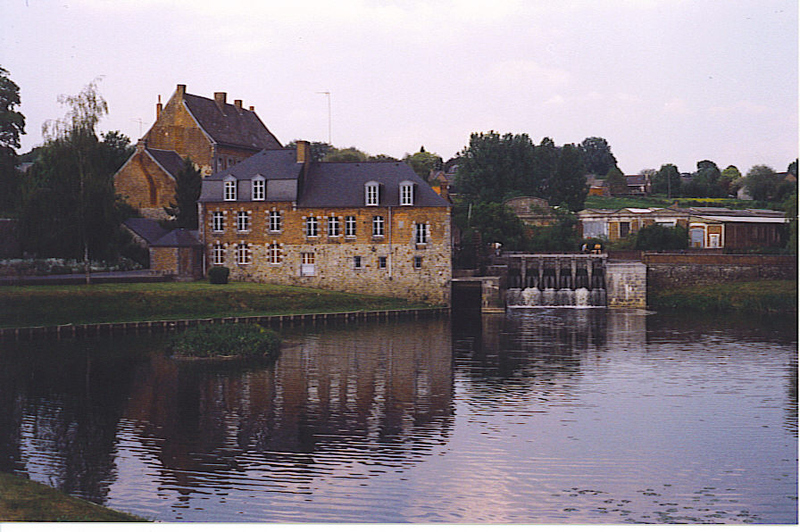 The image below of calm waters near a green-fringed, venerable mill is from Maroilles. In the image of cheeses above (see note below for attribution and license details), one can see the name “Jenlain” on the Maroilles. This means, I am quite sure, that well-regarded Jenlain, an artisan-style beer, was used to mature the cheese. 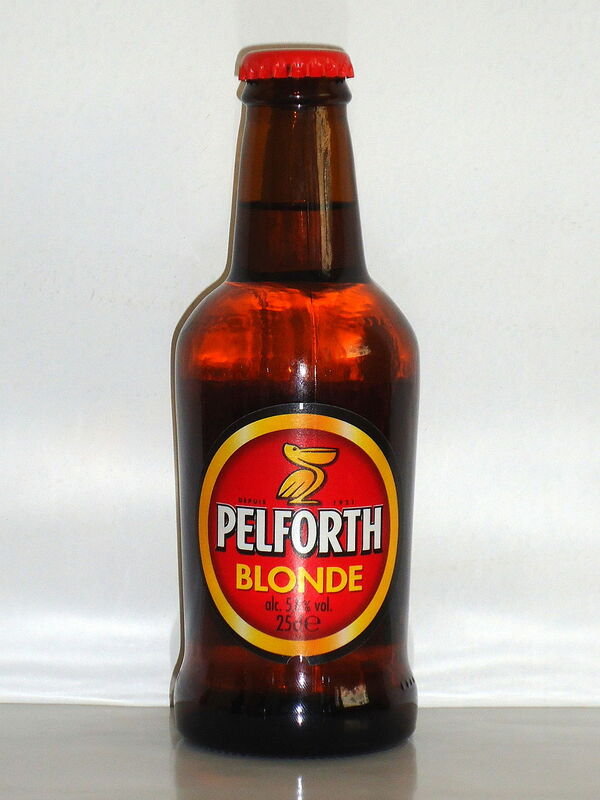 Pelforth Blonde is a classic blonde ale from Lille which has a large sale in the north and is not unknown in Paris. It accompanies well all cheeses of the region. Also on the cheese plate is a mimolette, in this case a well-aged one. It is the orange, scimitar-shaped slice. “Mimo”, as the nickname goes in the area, has a double aspect. When young it is fruity and a little rubbery, kind of a cross between a young red cheddar and an Edam. When well-aged, it dries to a salty, still fruity intensity. The history is not that old – a theme which recurs in French regional food, as the reader will have gleaned by now. Edam used to come down to Lille from The Netherlands, and after all part of the French north was in South Holland at one time and shares many of its food and drink habits. The first world war (1914-1918) interrupted supply, so the French started to make their own version, of which mimo was the result. Mi-molle, or half soft (when young) is the origin of the word mimolette. This cheese from the beginning had a more or less industrial aspect, which hasn’t prevented its appreciation by cheese fanciers everywhere. Today it is a well-established specialty of the Nord. You can get it in Toronto, usually when well-aged, but the young one comes in too sometimes. Last year I bought both mimo and Maroilles at the Loblaws cheese counter across the street from my place. 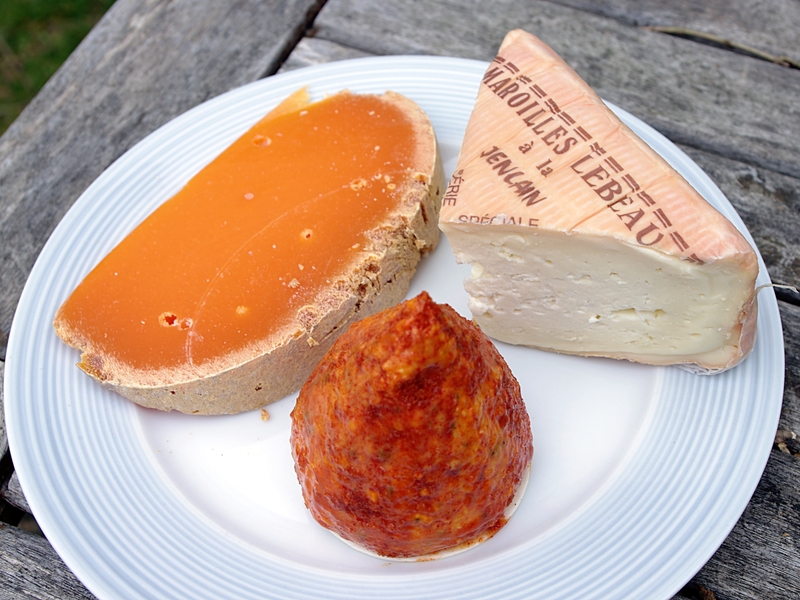 The third cheese in the image is the boulette d’Avesnes. Maroilles not deemed perfect for the market, and immature (white) Maroilles, are mashed up with pepper and herbs – parsley, tarragon – and maybe a little beer or genièvre, the Dutch-style gin popular in the area. The paste is formed by hand into a ball or cone-shape and coated with paprika which helps form a crust. The balls may be washed with beer as well in maturation. This is a local classic with a vigorous taste. When very aged, it, as well as similar preparations in the north, can attain an ammoniacal intensity that spells terroir with a capital “t”. I may review soon some of the other cheeses of the French north. Note re images: the first image, by 5esouts, called Fromages du Nord, appears courtesy Wikipedia Commons under this free documentation license. It was sourced here. The second and third images are in the public domain and were sourced from Wikipedia, here and here. All are believed available for educational and historical purposes. All feedback welcomed.